Presenting the 75th annual Hunger games! For this RMS, I have tried to recreate the arena from the 75th Hunger Games in Catching Fire. You start in the center and must decide whether to risk a brutal fight for the cornucopia of resources in the center or if you will face the uncertain dangers on the outside of the map. This version has no monsters, no recoverable gaia units, less elevation and fewer forests. Basically, this is if you don't want luck influencing your game too much. The Conquerors AI (the AoC AI) fails most of the time in my experience. The new AI in the HD Edition does considerably better and usually manages to build a town. Any custom AI that can play nomad maps might do ok on this map. Any AI will not be able to "recover" the Gaia units on the map, and will in general have a lot of difficulty playing this map. If it manages to attract an iron boar or one of the other monsters, that will also cause any AI considerable difficulty. That is why I suggest using a hard difficulty if you are playing with AIs. If you play this map on any of the non-steam versions of the game, it will crash about 10% of the time. This is due to a bug in the connections generation section, which I have yet to find a fix for. I'm guessing it is due to some sort of maximum number of connections bug that was fixed in the HD edition. If you know anything about this issue, please tell me! May the best tribute survive! 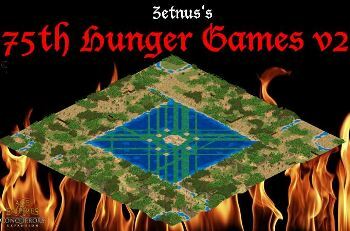 The 75th Hunger Games is a Random Map script created by Zetnus. The idea is that the random map tries to, as best as it can, recreate the arena that is seen in the film; 'The Hunger Games: Catching Fire'. This also allows the players to have a go a playing the Hunger Games themselves in AOK. As I said the idea of this Random Map is to recreate the Hunger Games arena. To this I give kit a score of 5. The theme is not only original but it is executed very well. I think the idea of the Hunger Games in AOK is a unique idea and something I'd never have thought of. It's not just the fact the map looks like the Hunger Games arena but it also sort-of plays a bit like the hunger games. You all start off in the middle of the map where there is a bunch of resources. You can either run and find shelter by building a base, or you can fight for control of the central resources. This is exactly what it's like in the Hunger Games story. There are also a number of GAIA objects that can be found around the map. This also fits into the Hunger Games theme because in the story the tributes get gifts from sponsors and can create alliances by recruiting other tributes, etc. As I said before the script is designed to try and recreate the Hunger Games arena from 'Catching Fire'. This is done very well. You have the large resource pile in the centre and a forest surrounding it. The author has also tried his best to fit with the clock face theme that is seen in the story by placing shallows to the resource pile around the lake like a clock face. It is clear that there has been a great attempt to make the map visual appealing with attempts at terrain mixing and lots of cliffs and elevation used. Forests are placed well and look realistic. However, the main problem I had with the map was the fact that there were Forage Bushes and Tree placed on the water. This makes it look unrealistic and it just doesn't look right. I also found the central lake too square. In the story the lake is circular, and I know it's rather hard to create accurate circles in AOK but, at least make some curved corners or something. The playability was pretty good. I found the map really fun to play and I found parts of it challenging at points. It was great fun fighting for the resources in the centre, especially the relics, and I also enjoyed racing round trying to collect GAIA villagers and other objects. The resources are placed around the map very well, so when you get to setting up a base, you have to choose wisely. I also like the default settings when you setup the game that the players are in teams of two, representing the two tributes from each district in the story. The main problem I found with the playability was the fact that the Standard ES AI on the Conquerors does not function with the map, nor do many custom AIs that I tried. Fortunately the author gives you a custom AI that works with the map and will not just stand around/explore. However, I did find the custom AI to be very challenging to beat as it built itself up quickly and constantly attacked me for the resources. Overall this RMS is a very creative and unique map that is great fun to play and will give you a new AOK experience. A recommended download.